In our last post we talked with Indian NGO, Video Volunteers, and we discussed their Video for Change model and how they measure impact. In this post we examine the impact of one of the videos made by Video Volunteers. Amol Lalzare is one of 120 Video Volunteer Community Correspondents who works with the Indian NGO, Video Volunteers. In October 2012 he posted the above 5-minute video to Video Volunteers’ IndiaUnheard video-sharing platform. The video tells the story of a community of 350 visually impaired residents of Vangani, a town located in the outlier districts of the city of Mumbai, who earn their living by selling wares to commuters in train compartments. Amol’s video focuses on the tragic accidents and near-accidents that have taken place because there is no foot-bridge to allow the visually impaired community to safely access the train platform. IndiaUnheard is a network of more than 100 Community Correspondents reporting from remote parts of India. It is also the name of Video Volunteer’s video-sharing platform and is considered to be “a community news service” by Video Volunteers. Launched in 2010 it supports Video Volunteer Community Correspondents to “tell unique stories; stories about their own communities; stories which are otherwise left untold.” Since 2010, Amol has published 25 videos on the IndiaUnheard website. Amol is now a full-time correspondent for Video Volunteers, having given up his job as a taxi driver to focus on this role. Since the foot-bridge is currently under construction, Video Volunteers have identified a direct and measurable impact. And while the building of the foot-bridge will make everyday life safer for a community of 350 visually-impaired citizens, Video Volunteers say that a further 8000-10,000 non-visually impaired people will also now have a safe means to cross these railway tracks. But, as Jessica Mayberry, Executive Director of Video Volunteers explains, there was also an impact on Amol, as the videomaker: “We can also see impact in terms of Amol and his stature in the community and his capability to achieve impact as a videomaker.” What is more difficult to measure, Jessica explains, are broader impacts on the community, given that people can now tangibly see how the local Community Correspondent is able to use video to help a community address local injustices. Added to these direct impacts on Amol and Vangani residents, through interactions with the Central railways, the campaign team was able to inject the opinions of an expert in disabled-friendly design into the planning process for the proposed bridge. As a result of this process, Central Railways has now acknowledged the need to incorporate inclusive design elements in all railway stations and they say the design of this foot-bridge will serve as a model for this. In this way, while the video and campaign began were focused on the critical needs of the visually impaired community that lives in Vangani, the process has also resulted in shifting the thinking of an institution that provides essential services to all Indian citizens, both disabled and non-disabled. In a video like this, with a direct and specific call to action, impact can be measured in terms of whether the specific, desired change has resulted. 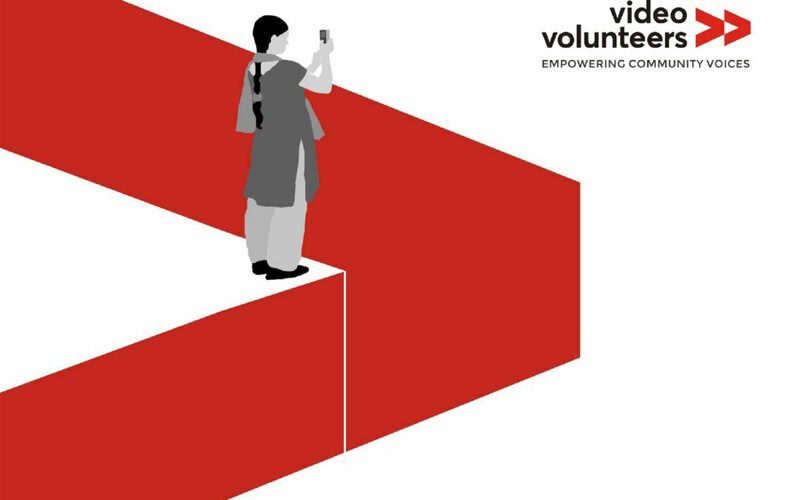 When this change takes place, in the case of Video Volunteers, this is almost always likely to be reported and documented by the relevant Community Correspondent, since there is a financial incentive to do so with RS5,000 (US$88) being paid to each Correspondent for documenting impact in a video. Other outcomes and potential causes of impact Video Volunteers have measured are: press coverage (in this case the story was reported in at least three national and regional media), online actions (6393 signed a petition), online views (their have been 2923 views of the video on IndiaUnheard) and offline screenings (there were two local screenings while the video also travelled across many cities as part of the ‘We Care International Film Festival’ where it was awarded a Special Jury award). Every video produced for Video Volunteers is meant to articulate a clear and measurable desired impact. Video Volunteers has two Impact Managers whose job it is to identify and support impact around videos and to track, document and measure impact. The Impact Managers follow-up with videomakers after they have produced a video with a list of around 50 indicators that they use to try and capture different kinds of impact and to understand their possible causes. The 50 indicators they use include tracking: the number of members from the community involved in the process, collaborations formed, legal and statutory bodies who were approached and those who facilitated the process, steps taken to involve the community, screenings/meetings held, the number of people directly impacted by the change created. Specific, concrete micro-changes can have a flow-on effect with wider implications. For example, through the process of lobbying for the foot-bridge, the visually impaired community at Vangani learnt they had significant support in the community (including a Community Correspondent). Central railways learnt about inclusive design and they were pressured into considering the consequences of designs that don’t consider disabled communities. A challenge here in trying to quantify and acknowledge the very real impact of this video relates back to the Community Correspondent model. While it might be ideal for Community Correspondents to take further actions that may result in additional forms of impact (for example, involve the local community in production, promote the video, screen the video), this needs to be balanced against the ‘community stringer network’ model used by Video Volunteers, which works on a shoestring budget in order to support as many correspondents as possible. Should impact then be understood only at the level of each video? ; or is it possible (and more appropriate) to consider the accumulative impact of and the sustainability of having a low-cost, local Community Correspondent? Video Volunteers do have a significant number of indicators for measuring the impact of making videos on Community Correspondents. It would be worth further analyzing this list and the experience of assessing impact this way to consider which, if any, of these elements might be transferable to other Video for Change models and projects. How should the broader impact of the national Community Correspondent network be measured? One challenge here is to consider how to understand the impact of a community knowing they have a Community Correspondent who listens, documents and responds to their needs by making sure their stories are heard by those who can change the situation.